I often sent pictures of the hills of Guilin which I painted to friends back home, but few believed what they saw. Explore the second of the 5 Chinese elements at Cee’s Fun Foto Challenge: Water. Funny how we have so many memories attached to water – we also taught our kids much about swimming in the bath – especially like your last photo of the bubbling jet. this is such a great capture!! Wow, this is gorgeous and moody–I like “moody”. Thanks – glad that comes through – that particular day was out of another century! Did you ever read any Victoria Holt novels? That’s what came to mind. Moody mysteries, with a certain elegance–page-turners, and perfectly tasteful for a teenage girl’s need for safe escape. Similar to DuMaurier, but not exactly. Wonderful photo. I could go there and meditate!!! thanks for participating! 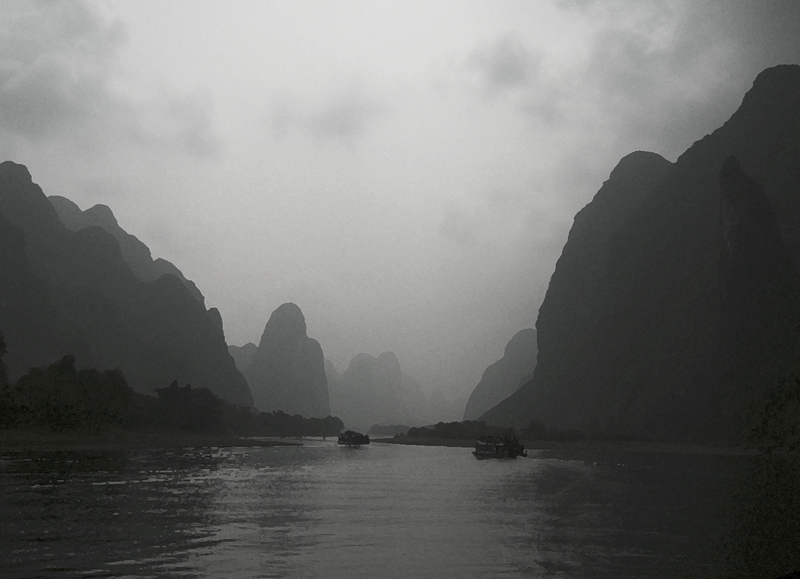 You would be in heaven on a Li River cruise – well worth the trip! Like your new gravatar! I’m an admirer ,it’s official….. Thank you so much – it’s feedback like yours that makes all the difference!